An online marketplace is a special eCommerce site that brings multiple third party sellers and buyers together with the transactions being processed by the marketplace operator. Some popular and well know online marketplaces include site such as Amazon, Freelancer, Overstock, Etsy, Odesk, Fiverr, Creative Market and Envato Market. Creating your own online marketplace website from scratch can be a complex and daunting task. From managing seller and user registrations, custom user dashboards and functionality, facilitating payments, delivery of products, email notifications and more, it can quickly become a massive and complex operation. However with these WordPress marketplace themes and plugins you’ll be able to quickly and easily build your own professional online marketplace for digital goods, physical products, or services. Marketify is a premium marketplace WordPress theme that lets you build a digital marketplace like ThemeForest or Creative Market and bring buyers and sellers together. You can use the Marketify theme to build any type of digital selling marketplace selling website templates, photographs, fonts, audio files, videos, or any other type of digital product(s). Marketify uses the free Easy Digital Downloads plugin and the Marketplace extension bundle for marketplace functionality. The theme / plugin combination allows authors to create accounts and list their products, and buyers can then purchase products and immediately have access to downloads. Some of the interesting marketplace features of the theme include: social logins, front end submissions, ratings and reviews, audio and video previews, customer wish lists, commission splitting with admin and authors, and more. The Marketify theme has a fully responsive design ensuring your marketplace will look great on mobile and tablet devices. It’s also highly customisable using the WordPress theme customizer so you can make design changes on the fly, offering unlimited colour, background image, and many other customization options. Makery is a marketplace WordPress theme that could be used for any type of marketplace website. More than a theme it’s an application solution with lots of great features. The theme adds unlimited number of shops functionality to WooCommerce so users can sign up, add shop, products, complete received orders, track shop earnings and withdraw them using front-end forms. 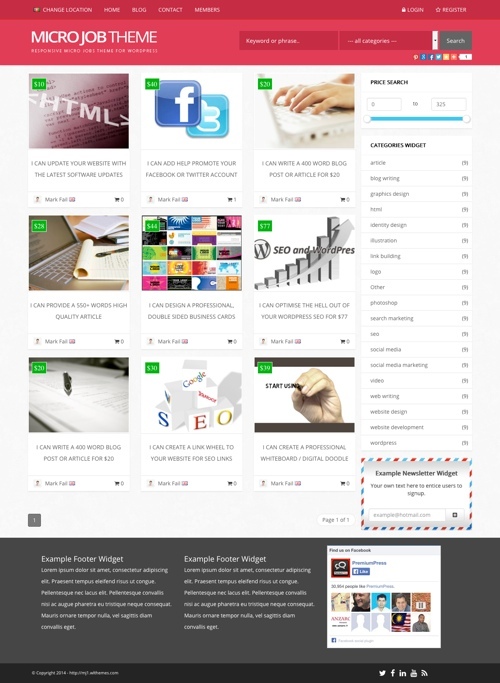 Other features include: extended WordPress profiles, mobile friendly responsive layout, email notifications, theme options panel (change fonts, colors, backgrounds, slider settings, switch between page layouts, create sidebars, edit email notifications and more), homepage slider, shortcodes editor and more. Olam is a marketplace WordPress theme that allows you to build your own online store or marketplace for digital products. The feature rich premium theme uses Eeasy Digital Downloads and associated EDD extensions so you can easily create a marketplace website to sell digital products like stock photos, plugins, software, audio files and more. Marketica is a WooCommerce WordPress theme that combines with the Product Vendors WooCommerce plugin to allow you to create a multi-vendor store marketplace. 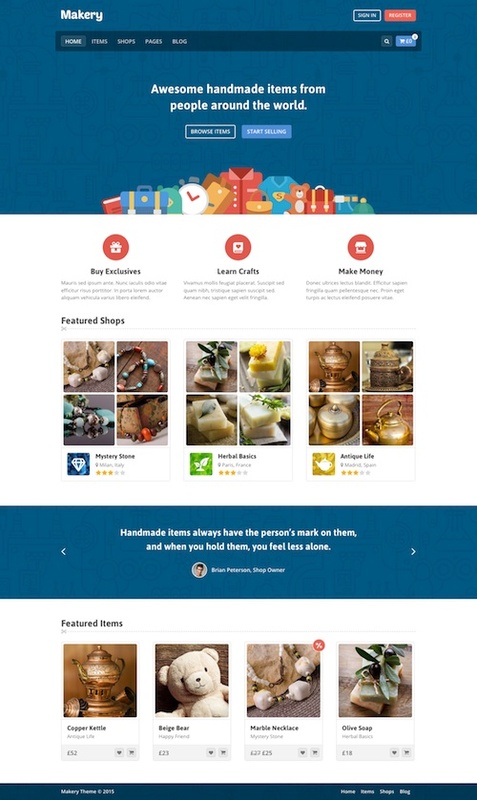 The theme and plugin combination lets you build any type of marketplace you want. You can easily allow vendors to create accounts and list their products for sale. Other features include: earn commissions in a multi-vendor marketplace, manage vendors, calculate commissions, manage commissions, pay commissions, and manage reporting. The Marketica theme is also flexible design wise. It has unlimited homepage layouts with a visual page builder, unlimited colors, unbranded theme settings panel, counters for users and items, email subscription (Mailchimp), logo uploader, post formats, slider, social media icons and more. The theme has a responsive design so will work on all tablets, phones and other mobile devices. Stocky is a stock photo marketplace WordPress theme that allows you to create your own stock photography marketplace website. The premium theme utilizes the free Easy Digital Downloads EDD plugin and premium Marketplace Bundle extensions to turn your WordPress site into a fully brown marketplace where anyone can upload their photos and sell on your site. The Stocky theme includes specific styling for the following EDD extensions: Frontend Submissions (allows users to register and sell their products on your site), Reviews (allows customers to leave reviews along with a star rating for products), Commissions (pay your vendors so you make money and they make money), Wish Lists (allows customers to create wish lists and check out with ease). Some of the other features of the Stocky theme include: a responsive and retina ready design, auto generated product galleries, localization for translation into any language, custom background images, multiple images for one item, colour picker for various elements, custom page templates (home, vendor portfolio,, login / register, contact), video options, Gravity Forms styling and more. The theme is built with HTML5 and CSS3 and has been tested and approved by the Easy Digital Downloads developer. Square Code is a hand crafted and bloat free WordPress theme specifically built for you to open an online marketplace with a very low cost. The premium theme utilizes the power of the free Easy Digital Downloads plugin together with a number of premium EDD extensions so you can easily build and customize your own multi-vendor marketplace selling all types of digital products, physical goods and even services. The theme has Front End Submission support so can run a full multi-author marketplace where authors can sign up to your website and upload products for sale. This includes then having their own unique brandable store front, special store header banner, contact form and bio, buyers can contact the author via their store page and more. You want to sell physical goods the theme supports the Simple Shipping EDD extension that allows you to collect shipping information for physical products. Or if you want to sell services the free Downloads As Services add-on for Easy Digital Downloads lets you use theme for a services marketplace. Some of the other features of the theme include: optimized product sales pages, support for the WordPress Customizer with lots of customization options (custom header, backgrounds, colors via color picker for all elements, logo, layout, footers and more), a custom dedicated homepage, slider, video and audio support, translatable and multi-languages, a full suit of custom page templates, and more. The theme is coded with HTML5 and CSS3 and is mobile friendly with a fully responsive design. The Micro Jobs theme allows you to start your own micro jobs website just like Fiverr & PeoplePerHour. The powerful and featured packed premium theme from Premium Press lets you easily and cheaply build a micro jobs marketplace that connects service providers with customers. Some of the key features of the Micro Jobs theme include: a built in submission form with customizable listing packages (free or paid job listings, and additional revenue options such as featured listings, Google Maps, image uploads and limit space, HTML descriptions, multiple category and paid category selections), Workflow and fund release tools (allowing buyer and sell to communicate quickly and easily via your website and manage fund releases upon completion), a user feedback and profile rating system, members area and order history + invoices, 30+ extra theme designs (child themes), multiple payment gateways, built-in advertising areas, easy customization options and add-on features, and a mobile responsive design that will work on large monitors, tablets, mobile phones and all other mobile devices. Freelance Engine is a premium WordPress theme from Engine Themes that lets you create a professional freelancer marketplace website. The app like theme has a simple, modern and unique design and is packed full of great features so you can create your own freelance marketplace website where any type of service can be offered just like Freelancer, oDesk, Elance or 99Designs. Some of the main features of Freelance Engine include: a custom eye catching homepage (with a hero image or video background option), premium page builder for complete customization (modular UI blocks for custom pages), an impressive full screen menu, employer and freelancer dashboards (to manage and control all their activities), pricing plans (limited free, normal and featured pricing plans), multiple payment gateways (PayPal, 2CheckOut, Cash, Bank Transfer), freelancer profile pages (they can insert their personal information, their hourly rate as well as adding their portfolios), project bidding and user interaction functionality, detailed search functionality for project matching, review system for both sides, customizable email templates, localization support and much more. The theme is built the Bootstrap framework and an independent mobile version for the theme is supported for mobile users which I think is a smarter option than responsive design for a complex app like website like this. Hire Bee is a freelancer marketplace theme for WordPress that allows you to build a freelance jobs website like Elance, Freelancer, oDesk, and 99designs. The powerful and featured packed application type premium theme from App Themes lets you create your own niche market place for any type of service where employers can post jobs / tasks and freelancers can bid to get the work. Some of the key features of the Hire Bee theme include: a clean and simple modern design, post a project with a custom project form (will all relevant information), notifications, user dashboard, flexible pricing plans, monetization options with various payment gateways, private workspaces only accessible for the project participants, flexible projects and credit plans, fast and easy project matching (through skills, category or location type filters etc), easy file uploading, terms negotiation, choose candidate options (analyse and choose the winning proposal), clean and simple admin options panel and much more. The theme is built on the fast and mobile responsive Foundation Framework so it’s accessible from any browsers or mobile device. Auto Dealer is a professional vehicle marketplace WordPress theme. The powerful and customizable premium theme has been specifically developed so you can build your own online car or auto marketplace website. Individual sellers or dealerships can list their vehicles for sales and buyers browse and search for vehicles to buy. 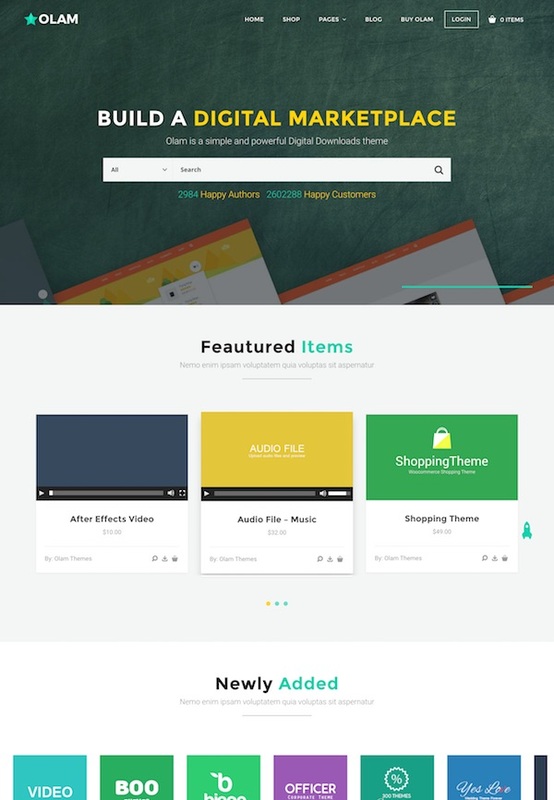 The theme has a unique front-end submission system with built-in payment packages powered by WooCommerce. Users can purchase submission packages to submit vehicles for sale on your website. Everything is done on the front-end so your users can, register, login, edit their profile, submit listings, manage listings, delete listings and so much more all from the front-end. Some of the key features of the theme include: 1 click automatic setup, built-in AJAX registration system and dealer profiles, email notifications for listings, built in search system with advanced filtering, WPML plugin support for multiple languages, 100% mobile responsive design, custom post types and taxonomies for vehicles, 3 different vehicle page layouts (grid, list and map), HTML5 and CSS3 code, icon fonts, fully customizable colors and layouts, mega menu system and more. Microjob Engine is an app WordPress theme that allows you to build a micro job marketplace website. The premium theme from Engine Themes has a simple and functional design with all the functionality you need to run a professional micro job marketplace. The platform connects professionals offering their services with people who need to get tasks done. It lets people find suitable service providers, order work, communicate and get tasks done quickly and easily. Some of the key features and functionality of the theme include: search functionality with filtering, effective review and rating system, impressive service details page and profile page, secure payment system, communication system for buyers and sellers, custom dashboard to handle everything, mobile friendly responsive design, email notification system, dispute management, multiple payment gateways, quick checkout flow, custom payment plans, money withdrawal management, customization and control options and much more. WooCommerce Themes – the Product Vendors extension for WooCommerce allows you to turn a WooCommerce site into a fully featured multi-vendor marketplace. It might be worth checking out the possibility of using a WooCommerce theme combined with the Product Vendors extension to build an online marketplace. Real Estate Marketplace Themes: This collection lists all the best real estate WordPress themes. Some of them have front end submission functionality that will let you build a real estate marketplace easily. Otherwise you could use plugins to make them into a marketplace.